I made this duck salad for dinner one night for my family, and it went down really really really well so I thought I'd put the recipe up here. I'm especially proud of it because it's (almost) my own creation. 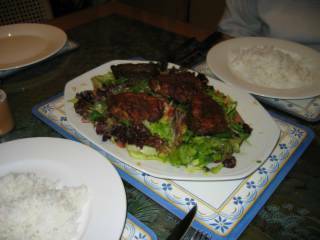 Actually, the idea is kind of adapted from a couple of Jamie Oliver and Nigella Lawson recipes which I make quite often - Jamie Oliver's beef carpacio (sliced rare beef on salad) and two of Nigella Lawson's duck salads. I'm absolutely bonkers for duck. It's expensive, but so so so nice, so it's like an occasional treat. And the spice mix is (unfortunately) not mine at all - it's from George Bilionis, chef at Souk in Chapel Street, and was published in the August 2004 issue of Australian Gourmet Traveller. It's meant to go on quail so I thought it might be good with duck. And it was! For spice mix, place peppercorns, cardomom and fennel, cumin and coriander seeds in a mortar and pound until finely ground. Sift through a fine sieve and discard husks. Transfer to a jar, add remaining ingredients and 1 tbsp sea salt, seal and shake to combine. This will make about 2/3 cup, which will last for ages. Sprinkle duck breasts generously with spice mixture, put on an oven tray (not oiled) and place in a 180C oven for 20 minutes. Once cooked, cover with foil and let rest for 5 minutes or so. Meanwhile, slice the red onion and orange finely. Place in a shallow bowl and add salt, pepper, the grated rind of the orange, the finely chopped chillies and oil. Mix around, and leave to steep while the duck cooks. Wash, and place the designer leaves on a large, wide plate. Slice the tomatoes finely and place on top. Pour the orange and onion mixture over the salad, and toss to combine. Slice the duck breasts thinly on the diagonal, and arrange over the salad. Scrape any juices from the board over the salad. Mum: This is really nice - you should make this again, and for guests. Dad & I: The duck breasts are $32 a kilo.